Google doesn't want any distractions from the launch of the new Nexus 4 handset by LG, pulling unlocked versions of the Nexus handset model from the Google Play store. Up until Monday, users could order an unlocked Galaxy Nexus phone through the Google Play store, but after the Nexus 4 was announced, the smartphone was listed as "no longer available for sale." Google confirmed to The Verge that the Galaxy Nexus' removal is meant to help shift focus to the new Nexus and the subsequent unlocked model now available for pre-order through Google Play. The unlocked smartphones through Google Play are nearly identical to those available through carriers, but with one major difference: they rely on HSPA+ for their 4G network rather than LTE. Though LTE networks are on the rise, they still do not have the widespread coverage of HSPA+ networks, making HSPA+ a more universal 4G option. Since the purpose of the unlocked handsets is universality, and LTE can be costly to add to a smartphone, Google has opted for HSPA+ on its carrier-free devices. Users determined to get a Galaxy Nexus can still find them through carriers, with Verizon and Sprint still holding LTE models in the U.S. 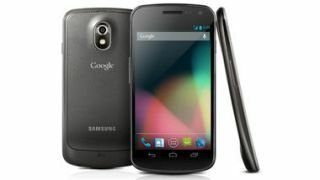 Meanwhile, the newly announced LG Nexus 4 is on the way, packing a quad-core Qualcomm Snapdragon S4 Pro 1.5GHz processor and an Adreno 320 GPU to support its 1280 x 768 screen. The display's pixel density is at an impressive 320 ppi, a spec that can compete with the iPhone 5's retina display. It also features an 8MP rear camera and 1.3MP front camera, wireless charging using the Qi standard and 16GB of storage. The downside on the storage front is a lack of SD card support, so there is no chance of expanding past that 16GB limit. The Nexus 4 is scheduled for a Nov. 13 release date through the Google Play store, putting it in a prime position for holiday wishlists as the year winds down.